465 attendees checked in – a new record! Friday morning’s Plenary began with updates from the other four Regional Internet Registries (RIRs). Adiel A. Akplogan, CEO, gave the AfriNIC Update remotely. Paul Wilson, Director General, gave the APNIC update, Nate Davis, Chief Operating Officer, gave an overview of ARIN’s activities and Luisa Villa, Customer Services Manager, gave the LACNIC Update. Axel Pawlik, Managing Director, RIPE NCC, also gave an update on the Number Resource Organization (NRO) Executive Council (EC) activities and Andrea Cima, Registration Services Manager, RIPE NCC, presented a global overview of allocation and assignment statistics. Filiz Yilmaz, Senior Director of Participation and Engagement, ICANN, gave the IANA Update. The Closing Plenary began with Geoff Huston, Chief Scientist, APNIC, giving an entertaining and informative presentation on IPv4 exhaustion. He advised the RIPE community that one working Internet requires keeping an eye on the global picture. He said addresses should be used in working networks instead of being hoarded. He concluded that a rapid exhaustion of IPv4 represents the best chance of achieving an IPv6 network. Next on the agenda were three IPv6-related lightning talks. Dave Wilson, HEANET talked about “Lessons from World IPv6 Day“, Antonio Marcos Moreiras, NIC.br, announced “LAC IPv6 Week” taking place from 6-12 February, 2012 and Jen Linkova, Google, talked about the “World IPv6 Event“. Randy Bush, IIJ, ended the lightning talk round with his talk on “RPKI Validation Performance“. The RIPE Programme Committee (PC) held elections for the revolving vacant seat. The audience thanked Rob Evans, who is standing down from the PC, for his work and the three candidates, Harald Michl, Piotr Strzyzewski and Filiz Yilmaz, gave a brief speech about themselves and their motivation. Filiz Yilmaz was elected by the attendees in the room by show of hands. It was announced that Joao Damas, IRC, was standing down from the Programme Committee. He received a standing ovation for his efforts in coordinating the RIPE Meeting plenary content over the last several years. Brian Nisbet, HEANET, was welcomed as his replacement. 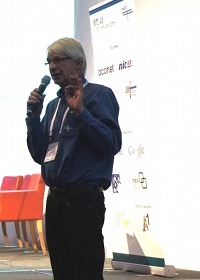 Earlier in the week, Wolfgang Nagele, RIPE NCC, had given a presentation on “IPv4 and IPv6 assignments for RIPE NCC Routing Information Service (RIS)”, asking if the RIPE NCC could keep using its assigned address block. Rob Blokzijl, RIPE Chair, asked the Plenary if it agreed. The attendees present agreed by show of hands. Marco Hogewoning, RIPE NCC, gave an update on the “Resource Request for Business Operations” that he had presented earlier in the week. He said that he had received feedback from the community over the week and the request was revoked as a result. Nigel Titley, Chairman of the RIPE NCC Executive Board, announced that Wilfried Woeber had been selected as the RIPE NCC Executive Board appointee to the NRO Number Council (NC). Erik Romijn, RIPE NCC, gave the RIPE 63 Technical Report. A report from the Secret Working Group followed and Rob Blokzijl closed the RIPE 63 Meeting with a short overview of meeting statistics, thanked the meeting hosts, the organisation team and the attendees and encouraged everyone to take part in the RIPE 64 Meeting, Ljubljana, Slovenia.